ingredients: 4 cups oats, soaked overnight 2 T Coconut Oil 1 cup Enlivened Almonds or Almonds, soaked and sprouted 1 cup Enlivened Hazelnuts or Oregon Hazelnuts, soaked and sprouted 1 cup Oregon Hazelnut Hempspread or Almond Butter 1/2 cup Hemp Seeds 1 T Pure Vanilla Powder, cinnamon, Maca Powder to create: 1. Soak nuts overnight 2. Drain off water. 3. Dehydrate nuts for 12 hours until crispy. Soak oats overnight. 4. Drain off water from oats. Mix all ingredients together. 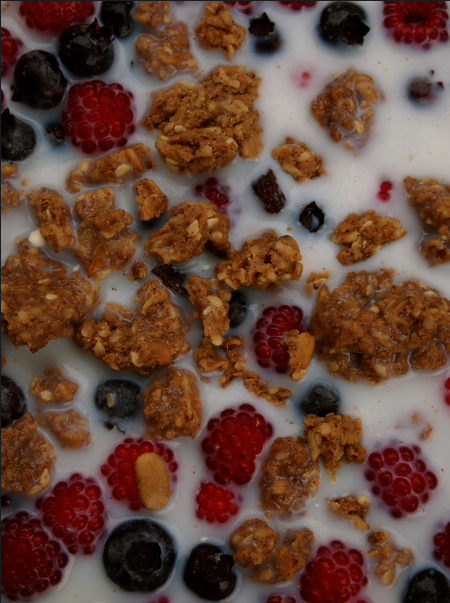 Spread out the granola-to-be-paste on dehydrator trays….dehydrate from 12-24 hours or until crispy. 5. Crunch ON!!! Eat with fresh fruit and nut milk, yogurt, or kefir…feeeeeeel the love!